Living in a Fleger Appartement is a little bit like coming home! 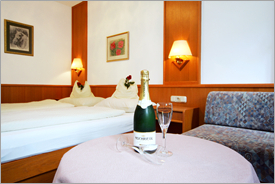 Fully-equipped holiday homes in a pleasant location in Vienna. Several times our Fleger Appartements**** have been awarded four stars. They are located in a quiet residential area but thanks to Vienna’s excellent public transport network you can easily reach any place in town (no need to hire a car). This beautiful city offers you plenty of culture, history and culinary specialities. Take your pick. Do you come to Vienna on business or to see friends or reatives? The choise is yours – the capital city of Austria has much to offer! We offer you a warm and friendly atmosphere in delightful, comfortable apartments – a true four-star-standard in our fully-equipped apartments (incl. a sufficient amount of pots, kitchenware and cutlery). We regularly look after each apartment, do the cleaning, provide fresh towels and bedlinen. A direct phoneline and WiFi is included as well. We want you to enjoy your stay in Vienna and look forward to welcoming you. Send us your enquiry and the preferred dates now and we will deal with everything else. The 40m² apartment is fully-equipped with Shower/bathroom/separate toilet, Hairdryer, Central heating, Radio alarm, Direct dial telephone, Cable TV(Flat Screens), Free WiFi, Toaster, Wall safe. he kitchen of every apartment is equipped with fridge, electric cooker, microwave oven, and coffee machine (+Filter and coffee) as well as a sufficient amount of pots, dishes, and cutlery. The 50m² apartment is fully-equipped with Shower/bathroom/separate toilet, Hairdryer, Central heating, Radio alarm, Direct dial telephone, Cable TV(Flat Screens), Free WiFi, Toaster, Wall safe. he kitchen of every apartment is equipped with fridge, electric cooker, microwave oven, and coffee machine (+Filter and coffee) as well as a sufficient amount of pots, dishes, and cutlery. The 60m² apartment can accommodate up to 7 people; they offer two separate bed sitting rooms, each with cable TV (flat screens) and free WiFi, a joint bathroom with either two showers or one shower and a bath tub and two large washbasins, as well as a spacious kitchen with eating area. Prices for our apartments and holiday homes include all taxes and charges, there are no hidden extras, regularly fresh towels and sheets, a weekly cleaning in case of a longer stay and free WiFi as well. You can pay cash for your accommodation, but we also accept most charge cards and credit cards. In case of a monthly booking we kindly ask you to pay the rate in advance always at the beginning of the month. Please note that we charge € 10,– for one night bookings. You can check in any time after 2 p.m., earlier access to your apartment might be possible on arrangement. Usual check-out from the apartment by 11 a.m.